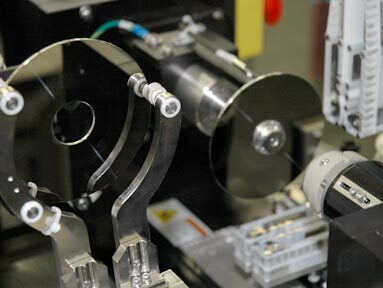 We are the premier custom factory equipment provider for the assembly and manufacturing of data storage devices. Over 60% of the world’ current media for data storage is processed by equipment using Owens Designs’ media handling solutions. We have developed a comprehensive family of solutions from high throughput linear tracks to ultra-precise vacuum chuck loading to cassette-less wet process cleaning. IPA vapor dryer (Marangoni Drying), 50 discs, cassette-less, fully automated lid and disc transfer to overhead gantry. Tape burnish system, multi-head, constant radial velocity, 48 – 95 mm form factors. Surface inspection handling system, automatic form factor change, cassette buffering, random slot access, particulate and vibration environmental control. Lubrication bonding activation system, UV light exposure, cassette buffering and management, 1,000 pph. 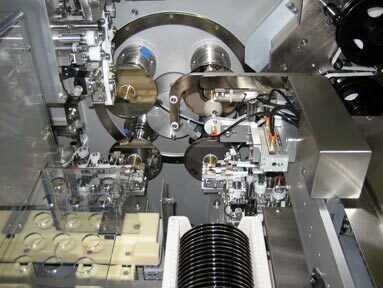 Nanoimprint mastering and replication handling system, quartz mask and disc media, optical pre-alignment to 50 um, integrated cassette management, disk swapping end effector, ULPA environmental control. HDD array burn-in tester loading system, factory interface module, incorporating 6 docking locations, interface to gantry robot. 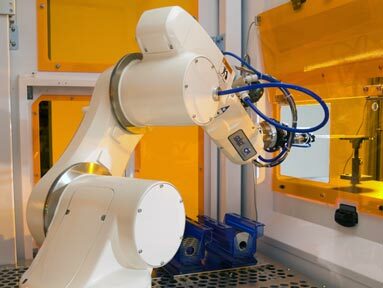 Data server assembly workstation, 4-axis and 6 axis robots, machine vision, screw driving, multi-end effector tool exchange, force tracking for component insertion.